Both the US and the Eurozone reacted to the Global Crisis by injecting liquidity and loosening monetary policy. This column argues that despite the similarities in the behaviour of bank credit, the behaviour of bank reserves has been quite different. In particular, while US bank reserves have been on an uninterrupted upward trend since Lehman’s collapse, EZ bank reserves have fluctuated markedly in both directions. At the source, this is due to differences in the liquidity injections procedures between the Eurozone and the Fed. Although it started in the US, the Global Crisis had non-negligible repercussions in Europe as well due to substantial purchases of subprime securities by European banks and financial institutions. Those problems were subsequently amplified by European sovereign debt crises experienced by countries with weak fiscal institutions. Both the Fed and the ECB reacted to their respective crises by injecting liquidity and generally loosening monetary policy. But due to structural and institutional differences as well as timing differences between the peaks of the US subprime crisis and the Eurozone sovereign debt crisis, there are noticeable differences between the policy responses of the Fed and the ECB. This column compares the behaviour of banking credit and banks’ reserves following major crisis triggers in the US and the Eurozone. Although the downfall of Lehman Brothers constitutes such a trigger for both the US and Eurozone, the latter was hit only by the blast waves of that event. An important, internally generated crisis trigger in the Eurozone was the November 2009 announcement by Greek Prime Minister George Papandreou that Greece’s annual budget deficit will be more than double the previously announced figure (Rebooting Consensus authors 2015). For the US, Lehman’s downfall obviously constitutes a clear watershed. Although it was affected by both events, the impact of the EZ crisis was stronger in Europe than Lehman’s collapse. The qualitative behaviour of banks’ credit following widely observed crisis triggers is similar in the Eurozone and in the US, but the behaviour of their reserves is quite different. This column argues that, at the source, this is due to differences in the liquidity injections procedures between the Eurozone and the Fed.1 Those different procedures are traced, in turn, to differences in the relative importance of banking credit within the total amount of credit intermediated through banks and bond issues in the Eurozone and the US, as well as to the higher institutional aversion of the ECB to inflation relatively to that of the Fed. Table 1 and Figure 1 show that total banking credit in both the Eurozone and the US expanded at average yearly rates of about 7% between 1999 and the last quarter of 2007. From Lehman’s collapse till the beginning of 2014, average yearly rates of credit expansion shrank dramatically – to less than 1% in the Eurozone and to 1.3% in the US. The credit shrinkage in the US preceded its counterpart in the Eurozone by one to two years. In particular, between October 2007 and September 2008 average credit growth actually went up to 7.7% in the Eurozone but dropped to 4.2% in the US. During the year following Lehman’s downfall, outstanding banking credit in the US actually shrank by 4.7%. Although it stayed in the positive range, the rate of credit growth in the Eurozone during that year dropped to 3.1%. Since Papandreou’s dramatic upward revision of the Greek deficit figure in November 2009 till February 2014 the yearly average growth rate of EZ banking credit dropped further to around 0.3%, but its US counterpart regained some ground – to 2.9%. 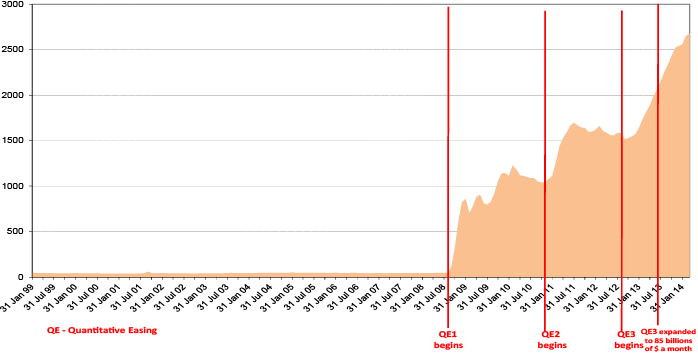 Both of those events are marked by vertical red lines in Figure 1. It is also noteworthy that from (roughly) the peak of the sovereign debt crisis in the Eurozone till February 2014, outstanding banking credit went down by, on average, almost 1% per year in the Eurozone (first memo item in Table 1).2 By contrast, the corresponding rate in the US was back up about half of the way to its pre-crisis level – a bit over 3.5%. Together, Figure 1 and Table 1 show that although credit growth in both the Eurozone and the US went down following Lehman’s collapse and Papandreou’s announcement, the impact of the first event was stronger in the US and that of the second was stronger in the Eurozone. Overall, in the five and a half years since Lehman’s collapse till the beginning of 2014 average yearly rates of credit expansion dropped to less than 0.8% and 1.35% in the Eurozone and in the US, respectively (second memo item in Table 1). Source: Eurozone - ECB; US - Bloomberg - Ticker: ALCBBKCR Index. Figures 2a and 2b show the evolution of total bank reserves in the Eurozone and in the US prior to and after the realisation of their respective crisis triggers. In both cases there initially is acceleration in the rate of growth of those reserves. However, since Lehman’s collapse, rates of reserve growth are substantially lower and much more variable in the Eurozone than in the US. In particular, since September 2008 bank reserves are on a sustained upward trend in the US while in the Eurozone they fluctuate substantially, both upwards and downwards. The vertical red lines in Figure 2a depict the beginnings of the main liquidity injections programmes of the ECB. The first of those is the fixed-rate, full-allotment (FRFA) liquidity provision that was introduced in October 2008. The second liquidity injection programme is the covered bonds purchasing plan (CBPP). It was introduced in June 2009 and stipulated the purchase of 60 billion worth of euro-denominated covered bonds over a period of one year.3 The third liquidity injection programme, known as the Securities Market Programme (SMP), was introduced in May 2010 and phased out in September 2012. It involved the purchase of mainly sovereign bonds on the secondary markets and was fully sterilised. The total volume of this programme peaked at around €210 billion. In December 2011 and February 2012, the ECB launched two waves of a Long-Term Refinancing Operation (LTRO) involving three-year loans to banks against appropriate collateral. The total amount allotted amounted to about €1 trillion.4 The last liquidity injection programme (within the time span covered in Figure 2a) known as Outright Monetary Transactions (OMT) €was announced in August 2012. Its objective was to buy EZ sovereign bonds with maturities of up to three years on secondary markets. As in other bond buying programmes the liquidity injections caused by those purchases were fully sterilised. It is apparent from Figure 2a that upon the inception of a given liquidity injection programme, total banking reserves at the ECB shoot up and decrease after a while. In the case of a bond purchase the initial increase is due to the fact that most of the proceeds from the purchase take the form of deposits within the banking system. In the case of direct liquidity injections to banks under programmes such as the LTRO, banks with liquidity deficiencies take advantage of the liquidity offered under the programme and use it to repay short-term debt to other more financially robust banks. Being flooded with additional liquidity, the latter types of banks initially deposit their excess liquidity with the ECB.5 The upshot is that under both liquidity injections – through lending to banks as well as through bond purchases – banking reserves at the ECB initially go up following a liquidity injection programme. Those additional reserves may go into either a ‘current account’ that is designed as a repository for required reserves, or into a ‘deposit facility’ that pays a higher rate and is designed as a repository for excess reserves. By definition, total reserves of the banking system equal the sum of those two accounts. Banks are free to determine in which of the two accounts they hold their reserves, and obviously have an interest to hold most, if not all, excess reserves in the deposit facility. This still begs a question about the mechanism underlying the reversals in total banking reserves some time after an expansionary monetary action. A possible explanation that follows is that ECB expansionary actions are often designed in response to tight market conditions during which there is a strong demand for liquidity for precautionary and even panicky reasons. By supplying this demand, an appropriately devised liquidity programme alleviates the panic, reduces the precautionary demand for liquidity, and encourages banks to convert some of their reserves into riskier but also higher yielding assets. I turn next to the evolution of banking reserves in the US before and during the Global Crisis. 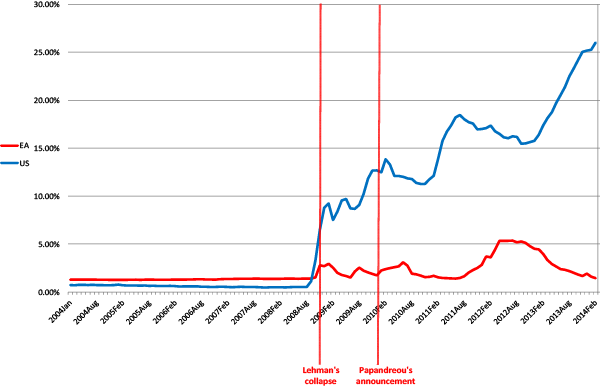 Figure 2b shows that prior to Lehman’s downfall total reserves of the US banking system were relatively steady at about $50 billion. Since that event reserves strongly trend in an upward direction. At the beginning of 2014 they are about 50 times higher than just prior to the collapse of Lehman’s Brothers. Their level evolved in tandem with the magnitude of the various quantitative easing (QE) programmes used by the Federal Reserve System in order to inject liquidity into the economy. 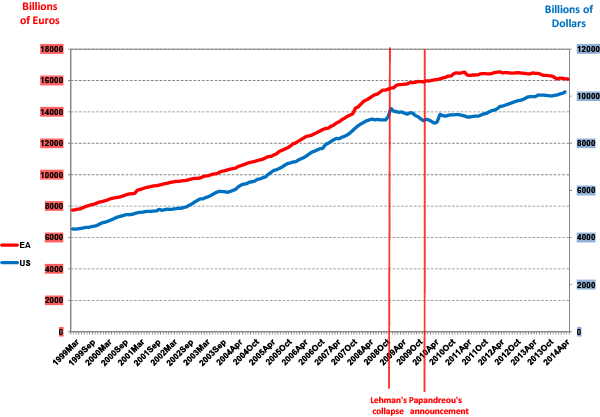 The beginnings of each of the three major QE programmes are marked in the figure by vertical red lines. Under QE1 that started in September 2008, the Fed purchased about $2 trillion worth of bank debt, mortgage-backed securities, and treasury notes. In November 2010 the Fed announced a second round of quantitative easing ‘QE2’, buying $600 billion of treasury securities by the end of the second quarter of 2011. A third round of quantitative easing, ‘QE3’, was announced on 13 September 2012. In an 11-to-1 vote, the Federal Reserve decided to launch a new $40 billion per month, open-ended bond purchasing programme of agency mortgage-backed securities. In December 2012, the FOMC announced an increase in the amount of open-ended purchases from $40 billion to $85 billion per month. This amount has gradually been reduced and finally converged toward zero in October 2014. Why has the behaviour of banking reserves in the Eurozone and the US been so different? Figure 3 compares the evolution of the ratio between reserves and total banking credit in the Eurozone and in the US. Since Lehman’s collapse this ‘reserve ratio’ is substantially lower in the Eurozone than in the US.6 Another post-Lehman difference is that, while this ratio has been on a strong upward trend in the US, there is no such trend in the Eurozone. Following is a discussion of the reason for those differences. Sources: EZ - ECB; US - US - Bloomberg - Ticker: ALCBBKCR Index. Between October 2008 and the beginning of 2015, the ECB largely supplied passively banks’ liquidity demands at the current policy rate.7 This was done mainly through repos with fixed redemption periods. As a consequence, provided they have appropriate collateral, banks largely determine the outstanding quantity of repos, implying that the level of reserves in the Eurozone is determined through an interaction between the terms of the repos set by the ECB and the demand for this liquidity by EZ banks. Hence, both reserves and the monetary base are determined endogenously by the liquidity demands of the banking system. By contrast, since the onset of the subprime crisis, liquidity injections in the US mainly take the form of massive purchases of securities including, inter alia, US treasury securities, Federal Agency debt securities, and MBS. As a consequence, the level of reserves and the monetary base since the onset of the Crisis are largely determined by the Fed’s policy decisions about the volume of open-market operations. Due to those procedural differences, the monetary base and reserves in the Eurozone are highly sensitive to short-run fluctuations in banks’ demand for liquidity while in the US those aggregates mainly reflect the Fed’s quantitative easing policy decisions. This explains the fact, documented in Figure 2a, that since the start of the Global Crisis, EZ banking reserves experienced strong fluctuations in both directions. By contrast, in the US due to the Fed’s determination to flood the economy with liquidity, the monetary base has been on an uninterrupted upward trend since Lehman’s collapse. This difference in policy procedures explains the fact, documented in Figure 2b, that US banking reserves have been on a persistent upward trend since that event. By definition, the monetary base is composed of banks’ reserves plus currency in circulation, implying that any exogenous policy increase in the base must take the form of an increase in either reserves, currency or both. Although part of the increase in base money usually leaks into cash the bulk of it takes the form of an increase in reserves. There are two main reasons for this difference in policy procedures. The first is the substantially higher share of banking credit within total credit in the Eurozone. The second is the relatively higher conservativeness of the ECB in comparison to its US counterpart. The share of banking credit in total credit (outstanding banks’ credit plus outstanding bonds issued) is substantially higher in the Eurozone than in the US. In particular, since the beginning of the 21st century, the average share of banks’ credit within total outstanding credit has been over two thirds in the Eurozone and only about a quarter in the US. Figures 4 and 5 illustrate this dramatic long-run structural difference. This difference mainly reflects the fact that the bond market is substantially wider and deeper in the US than in the Eurozone. An important consequence of this difference is that (as far as financial stability is concerned) the prime concern of the ECB is about liquidity deficiencies within the banking system while the prime concern of the Fed is about scarcity of liquidity in the bond market. This difference in relative concerns about the two segments of the total credit market dictates different choices of policy procedures. Since it is mainly interested in maintaining sufficient liquidity within the banking system, the ECB operates mainly by offering various types of loan facilities and repos to the banking system. By contrast, since the Fed is concerned in first place by lack of liquidity in the bond market, its prime instrument for liquidity injections are open market operations or outright bond purchases. Source: Bloomberg - Ticker: ALCBBKCR Index; SIFMA. A second structural difference between the ECB and the Fed is that the former is more conservative in the sense that its charter elevates the price stability objective above all other objectives. By contrast, the Fed’s charter puts price stability and high levels of employment and economic activity on equal footings. One consequence of this stronger inflation aversion of the ECB is that it waits longer before implementing substantial liquidity injections and, as was the case during the Crisis, maintains them at levels that are lower in comparison to their US counterparts. Another consequence is that during stress times the ECB prefers to directly supply self liquidating collateralised emergency liquidity to banks rather than to engage in longer term open market purchases. Interestingly, with the prolongation of recession and negative inflation rates in the Eurozone, this position of the ECB is being eroded. A recent volte-face on the part of the ECB is its decision in January 2015 to dramatically expand the volume of bond purchases to include the obligations of EZ central governments, agencies, and European institutions. Bindseil U (2014), Monetary Policy Operations and the Financial System, Oxford University Press, Oxford, UK and NY, NY. Cukierman A (2014), “Euro-Area and US banks’ behaviour , and ECB-Fed monetary policies during the global financial crisis: A comparison”, CEPR DP 10289. Rebooting Consensus Authors (2015), “Rebooting the Eurozone: Step 1 – Agreeing a Crisis narrative”, VoxEU.org, 20 November. A detailed account of the ECB’s policy procedures appears in Bindseil (2014). CDS rates on Greek government bonds hovered in the vicinity of their all time high of 35% during the end of 2011 and the beginning of 2012 (details appear in Figure 7 of Cukierman 2014). A second CBPP for a total of 40 billion euros was initiated in October 2011. In July 2014 a new Targeted LTRO was introduced. This process was strongly in evidence during the acute phases of the Eurozone sovereign debt crisis in which relatively liquid banks in the core countries were unwilling to directly lend to other banks but were willing to do that trough the intermediation of the Eurozone. Note that this concept differs from the conventional reserve ratio that is defined as the ratio between reserves and deposits. Obviously those two concepts are closely related. However, following a prolonged period of negative inflation rates the ECB introduced in January 2015 a large asset purchase programme aimed at buying bonds of EZ government, agencies, and other European institutions.